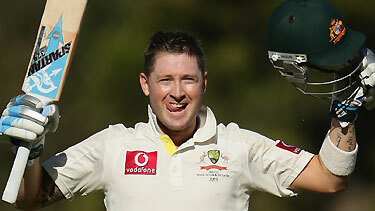 Australian captain Michael Clarke did what even sir Don Bradman was never able to do. He scored his fourth Test double-century this year. Australia scored 482 runs which is the most they have scored in one day of Test cricket since 1910. Graeme Smith could literally do nothing to stop the runs. At the end of the day’s play, Clarke was unbeaten on 224. Its back to back double century for him. At the start of the day, David Warner scored 119 runs off just 112 balls while Michael Hussey scored his second consecutive century. He was out at 103 on the last ball of the day from a delivery by Dale Steyn. The most important aspect of the day was the rate at which Australians scored. They batted with a run-rate of 5.55. Australians were struggling initially, with 3 wickets down at 55. However, the South African attack was helpless against Clarke, Hussey and Warner. After the first hour, nothing went right for South Africa. Jacques Kallis left the field with hamstring injury while Dale Steyn left the field with hamstring tightness, although he returned late in the day to remove Hussey. South Africa created few opportunities in the day. On 64, Hussey was given out caught behind but he asked for a review and Hot Spot showed no touch on the bat and the decision was turned down. At 73, Clarke edged Kleinveldt but the ball flew between the two slips. Clarke-Hussey partnership was worth 272. From SA perspective, only Kallis was impressive with the ball during his short spell as he removed Ed Cowan and Ricky Ponting.